Thank you r' Eli for adding me to the blog. Name's Natan. Chabad Sofer in Montreal, CA. I had a sheila concerning this Reish, but I got so many different opinions and views about it, that I wanted to post it here in order to hear your views and reasoning about this Reish of Ukshartam. For me it is a sensitive case with a client that I could not clear cut yet in either direction. Welcome to the forum. 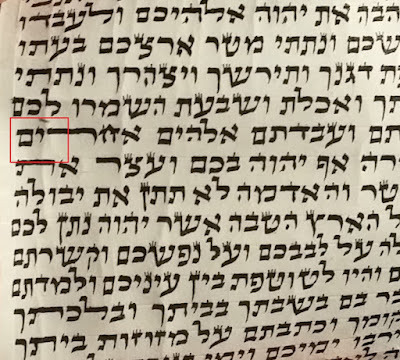 This is one of those cases where we should not be quick to invalidate the letter as there does not appear to be a clear ZAVIT on the top right corner. Is it possible to get a straight front look in which the letters do not appear at an angle? From what I see, it appears as a Sheelat Tinok, but I think that we will all benefit from a frontal view. I just replaced the picture with a frontal view one. It is true that the Tinok is used to a Dales with an Ekev, but we could still see if he recognizes a Reish. I don't get what you mean. 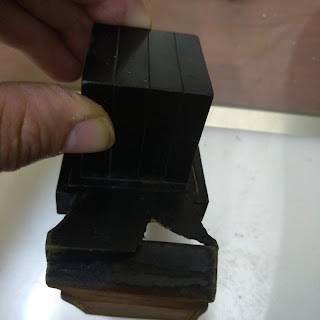 What "Bais Hastam" is saying is that any normal tinok nowadays will read it as a reish, but that is not enough to be machshir, since would the tinok recognize a "right-angle" dalet, which according to the Mishna Brura and others is the ikkar tzura of a dalet, the fact that he reads this reish as a reish is not a raaya that it has its tzura; it is likely that our tinokos simply do not recognize "eikev-less" dalets. I meant to say that it happened to me in the past that the tinok simply didn't recognize the letter and stopped reading every time I showed him the letter in question. 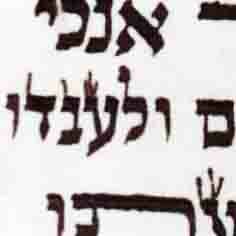 So in our case, I thought that maybe if the tinok reads Reish, it'll be good, and if he can't read it, it would not. Also my question stemmed from the fact that the angle isn't 90 degree, but rather 100, so it's not the typical theoretical square Dales. Thanks. I see it as 80 degree angle?